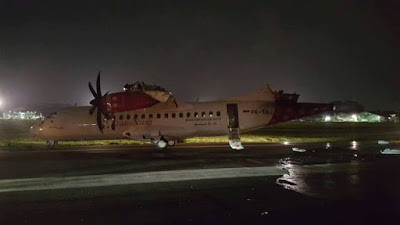 Aviation Updates Philippines - A Batik Air Boeing 737-800 was on its take off roll at Halim Perdanakusuma airport, Jakarta when its wings clipped with a Transnusa Avions de Transport Regional ATR 42-600 being towed currently at that time. The 737-800 flight was already cleared for take-off. According to The Aviation Herald, the TransNusa ATR 42-600 was crossing the runway while being towed. The aircraft's tail together with the left wing was separated. The incident also ruptured the aircraft's fuel tank, making it on fire. 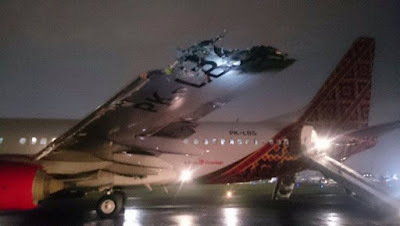 Fortunately, fire personnel of the airport in Jakarta managed to put off the fire on both aircraft in just a few minutes. None of the 49 passengers and 7 crew of the Batik Air flight were injured, including the occupants of the TransNusa flight. 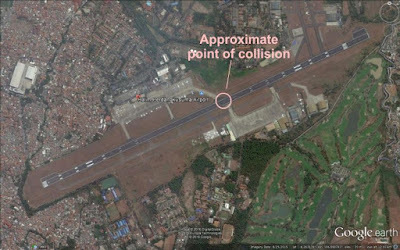 "Ground observers reported the Boeing 737-800 was already accelerating for takeoff from runway 24, when the ATR under tow crossed the runway about 1280 meters/4200 feet down the runway. The Boeing rejected takeoff but could not stop in time to avoid the collision." an Aviation Herald report stated. Radar data suggests that the Boeing 737 was already rolling at 110 knots when the pilot in command aborted take-off to avoid collision. However, the aircraft came to a stop about 500 meters past the intersection of the runway with the only crossing taxiway.